Before reading this topic, you might find it useful to get familiar with the Template Structure of the GridViewGroupPanel and GridViewGroupPanelItem. In order to style all RadGridView group panels of an application, you should create an appropriate style targeting the GridViewGroupPanel element. 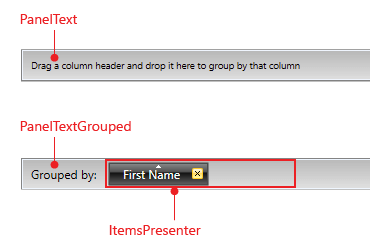 To learn how to modify the default GridViewGroupPanel style, please refer to the Modifying Default Styles article. If you're using Implicit Styles, you should base your style on the GridViewGroupPanelStyle. 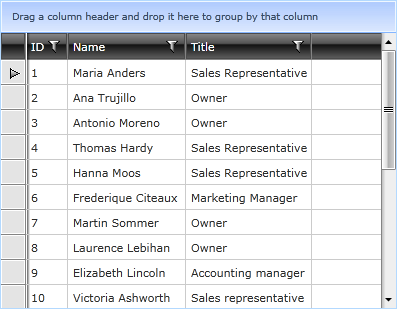 If you're using Implicit Styles, you should base your style on the GridViewGroupPanelItemStyle. The GridViewGroupPanelItem wraps the GridViewGroupPanelCell control, which represents the visual item in the Group Panel. If you want to style it, you should create the appropriate style, targeting the GridViewGroupPanelCell element. If you're using Implicit Styles, you should base your style on the GridViewGroupPanelCellStyle. RadGridView exposes two properties of type Style - GroupPanelStyle and GroupPanelItemStyle. They are applied to the Group Panel and its items. A simple way to change the group panel's foreground and background is through RadGridView's GroupPanelForeground and GroupPanelBackground properties. Example 5 shows how this can be done.